In July 2009, something quite unusual began to appear in the lobbies of Lithuania's largest supermarket stores-colorful raw milk vending machines that dispensed milk that had been delivered to the supermarkets directly from the farm. The lines of customers at these machines were long but moved quickly as plastic bottles were rapidly filled with milk, a process that was accompanied by the sounds of whistling and popping of plastic caps in the frosty, vacuum-tight chamber of the vending machine. As many of the consumers I interviewed noted, the raw milk coming from the vending machine was the purest and safest in the sense that it did not have "direct contact" with air as it flowed from cows through tubes to containers to the vending machine. Consumers were protected and so were their kin who drank the milk at home. The appearance of these vending machines in Lithuania is significant not only because it marks the introduction of new technologies for handling food risks in the European peripheries, but also because it interrupts the informal raw milk economies that have defined postsocialist Lithuania's dairy sector for almost two decades. Before vending machines, raw milk in Lithuania was available only along street curbs and through trust-based, face-to-face transactions. Since the end of state socialism and subsequent land privatization reforms in the region, semisubsistence farmers have been delivering raw milk to the cities and selling it directly to urban consumers, circumventing large-scale processors and supermarkets (Harboe Knudsen 2012; Mincyte 2012; Nicholson 2003). The milk flowing through these networks arrived in the trunks of unrefrigerated cars and was poured by farmers from large metal containers into jars that consumers brought with them. Alternatively, milk was also packaged and sold in recycled soft drink bottles and other containers. This economy relied on poor producers who either did not or could not afford to apply for European Union (EU) support to modernize their farms, and on impoverished urban consumers who were dependent on fixed incomes. Although these informal economies might have raised public health concerns to some observers from the "West," raw milk deliveries were considered valuable and were much coveted among consumers. Consumers particularly appreciated the considerably lower prices of the milk (about half the supermarket price) and the opportunity to socialize and connect with their neighbors and the farmer while waiting for the deliveries. In this sense, raw milk deliveries emerged as ways for mediating economic risks and opening much-needed public spaces in the context of the liberalization of market economies. In light of these factors, the installation of the vending machines in Lithuanian supermarkets has transformed these informal economies in important, even irreversible, ways, by bringing to the fore questions about their cleanliness and safety. Because the raw milk sold in Coca-Cola bottles was recast in the moralizing language of hygiene, public health, and quality, so too were the people involved in these "dubious" economies. Now that there was "quality" raw milk available through a vending machine, consumers faced a choice between trusting the farmer who sold milk on a street curb and buying tested and highly regulated milk at the supermarket. In this manner, the introduction of this new mode of food production, consumption, and distribution exposed the live nerves of disputed claims to authenticity, safety, and value. At the center of this transformation is the emergence of two competing ethical orders. On the one hand, the participants in the vending economy emphasize their commitment to food safety and public health, which are ensured by adherence to rigorous food hygiene requirements. By underscoring safety, these narratives equate food safety with care for one's families, particularly the young and the old. In some cases the safety concerns spill beyond concerns with risks related to food and other consumables to include questions about safety in urban spaces. In such discourses, producers and consumers emphasize the value of cleanliness and order in their surrounding environments, contrasting it to the disorderly, law-breaking behaviors of the unauthorized milk sellers in their neighborhoods. Most importantly, these narratives reproduce and naturalize the language of governmental institutions and European bureaucracies that have framed their mission in terms of protecting the general public and ensuring order. On the other hand, members of informal raw milk networks who express their ethical position through the emphasis on personal responsibility see themselves as self-reliant actors surviving in a world where the cards are stacked against them. Similar to the consumers of store-bought raw milk, who assert care and family values as their moral compass, the consumers in informal markets, too, underscore their commitment to the family. They frame raw milk deliveries as ways to acquire inexpensive food that enables them to provide nutritionally superior meals for the members of their households. But rather than trusting the industry and state institutions to ensure food safety, they place value on their own skills, knowledge, and creativity in procuring what they consider healthy food. Similarly, semisubsistence producers underscore their hard physical work as an ethical way of making this food. They also adopt the language of care for the health of their farmland and animals, claiming that both are attended to more conscientiously than in the industrial sector. In this analysis, I explore the ways in which these two ethical domains intersect and are reproduced. Specifically, I focus on the emergence of the new industrialized farms and raw milk vending industry as a locus where new ethical claims are cast. In developing this line of inquiry, I ask: What economic, social, and political institutions play a role in creating the new ethical domain? How do these new ethical projects translate into material realities? More broadly, what does the case of raw milk in Lithuania reveal about the ways in which we think about food ethics in Eastern Europe and beyond? Relying on ethnographic fieldwork, governmental reports, and interviews with officials of state institutions, consumers, and farmers, I aim to show that there are several scales at which food ethics work, including those of farmers, nation-states, supranational organizations, and international entities (cf. Wilson this volume). I argue that these ethical projects are hierarchically structured, with dominant or hegemonic orders drawing their power by claiming superiority over "backwards, unsafe, and untrustworthy" practices and individuals. More specifically, I argue that European state institutions have played a central role in the shaping of what is considered ethical food in the postsocialist space in general and in Lithuania in particular. In their attempts to establish legitimacy in the context of the liberalization of markets, European state institutions have been committed to supplying citizens with access to cheap and safe food, while grafting these efforts onto the European state-building project and its vows of democracy. It is in this larger historical and political context that the morality of cheap food won out over other competing concerns, effectively catering to the industrial interests. In Lithuania, this meant that the undergirding industrial farms and artisanal niche markets received preferential treatment as the embodiments of these European projects and have prevailed over semisubsistence agriculture and informal dairy networks. Although each term has a long and rich history of public polemics and academic debate, I approach the concepts of "ethics" and "morality" as overlapping domains in that they refer to a consensus about codes of conduct, prescriptions for how to live one's life, social expectations, and shared visions of how things should work and what the world should look like. More specifically, I use morality when I refer to individual responsibilities and commitments, and I use ethics when I speak about the transactions taking place in the broader social systems and institutional settings. This analysis is organized into four sections. The following section presents a brief historical background needed to understand land use patterns as well as dairy production and consumption in postsocialist Lithuania. I then present the case of the young farmer who introduced raw milk vending machines in Lithuania and discuss the ethical dilemmas that the new generation of successful producers face on their farms. The section that follows extends beyond Lithuania's borders to consider the questions of ethics in the development of agrifood politics in Europe. This section explains how and why the European Union has introduced a particular regulatory regime that supports industrialization and niche markets to the benefit of the vending industry and the detriment of informal economies. I then conclude with a short discussion of economic diversity. Technology was used scarcely, if at all, on these farms. While major consolidations of agricultural production swept through Lithuania in the mid-2000s, it was still not uncommon to see carriages pulled by horses or cows milked by hand. As in other similar agricultural systems, most of the labor in these small-scale farms was supplied by the household, while cash came from selling surplus to processing companies and, most often, directly to consumers. Scholars who have analyzed these postsocialist changes in land ownership and labor have defined them variously as involution (Burawoy et al. 2000; Humphrey 2000; Zbierski-Salameh 1999), primitivization (Clarke et al. 2000; cf. Ries 2009), repeasantization (Cartwright 2001; Creed 1995; Leonard and Kaneff 2002), and even as a return to feudalism and a medieval existence (Shlapentokh 1996, 2007; see also Verdery 1996). At the other end of the economic spectrum, the emergence of raw milk vending signals the consolidation of ownership, increasing investments in industrialization, access to waged labor, and the relatively unobstructed flow of capital. These are all signs of the liberalization of market economies in the postsocialist region. The introduction of the milk vending machine itself reflects the drive toward higher profitability through investments in technology typical of the treadmill of production economies (Gould et al. 2004; Schnaiberg 1980). One of the central forces behind these changes is the strengthening of state institutions that protect and enforce contracts as well as ensure trust in anonymous economic transactions. Such a move was made possible with Lithuania's accession to the EU in 2004, when the country's legislative, policing, and financial systems had to be harmonized with those of the older EU member states. In addition to the legislative structures, accession to the EU also brought an influx of EU funds via the Special Accession Program for Agriculture and Rural Development (SAPARD) and later the Common Agricultural Policy (CAP). These financial instruments poured money into the modernization of agricultural production. The dairy processing industry remained relatively stable despite transformations in property regimes, land use patterns, and rural development politics that led to the emergence of semisubsistence farming and heavily industrialized production. In contrast to many other food items, industrialized milk did not totally disappear from the shelves of urban stores, as newly privatized milk processing companies continued to collect surplus supplies from farmers and then sold the milk in stores. Milk-collection prices were, however, meager and many farmers looked for ways to eliminate the middleman (that is, the processing industry) in order to sell milk at higher prices directly to consumers. Farmers who lived close to cities looked for opportunities to sell milk to the consumers they already knew in the cities and began delivering milk to urban centers themselves. Since the raw milk that flows through these informal markets is not monitored by the State Food and Veterinary Service, which is responsible for safeguarding the interests of consumers and preventing diseases, it is difficult to calculate its actual market share in Lithuania. As Lithuania was preparing to join the EU, several statistical reports afforded a glimpse into the proportion of milk that flowed outside the processing industry in the mid-2000s. In 2004, 45.6 percent of all the milk produced in Lithuania was claimed to be delivered directly to consumers; the rest was reported as sold to processors. The EU-15 (Western Europe) average was 4.8 percent, and for EU-25 (the enlarged Europe) the proportion was 8 percent. The only EU country whose milk deliveries were comparable to those of Lithuania was neighboring Latvia, where the reported proportion of milk delivered outside of dairies in 2004 was 39 percent. It should also be noted that even with almost half of the milk circulating outside of the industry, dairy processing was still the largest food processing industry in Lithuania with sales worth $472 million in 2004.2 Even though it is difficult to calculate profits in informal markets, the fact that a little over half of all milk deliveries were adequate to support the country's largest and most profitable food processing industry implies that informal dairy, too, constituted an important economy in Lithuania's globalizing markets. Beginning in 2008, the situation in the raw milk markets changed significantly when the State Food and Veterinary Service issued a set of regulations that made it easier for medium-sized and large producers to enter raw milk markets, which until then had been dominated by informal networks. These regulations streamlined the application process for permits and delineated requirements for milk production (Regulation B1-251: No. 56-2138 and No. 145-5860, April 28, 2008). The regulation included: (1) livestock health requirements, (2) milk storage and transportation conditions, (3) microbiological contamination limits and information on fat contents, (4) hygienic requirements for dairy processing facilities, (5) staff health requirements, (6) accounting and recordkeeping rules, and (7) laboratory testing schedules. The regulations also established that labels on milk containers had to indicate the permit number, name and address of the farmer, and date of production. Further, regulations stated that it must be clearly marked on the bottle that raw milk had to be pasteurized before consumption. With the introduction of raw milk regulations, it became easier for the Food and Veterinary Service not only to monitor informal dairy producers, but also to punish them for violating food safety requirements on multiple counts. Most importantly, new labeling regulations and certification schemes created conditions for the emergence of qualitatively new economic niches for artisanal and health products sold in supermarkets, shopping centers, health stores, and farmers' markets. Many consumers who had never before entertained ideas of buying raw milk on the street quickly responded to the "new" milk and praised it as one of the healthiest and most natural products available in Lithuania's supermarkets. In this respect, it is not surprising that the raw milk vending economy was born in Lithuania in the midst of what Marilyn Strathern calls the thriving "audit culture" (2000) that characterizes the technocratic logic of European governance. The artisanal raw milk produced on the farms that implement the newest monitoring and process-control technologies are the embodiments of the values of safety, productivity, and profitability that the regulators were hoping to see. To understand the ways in which milk is produced and how ethical and moral considerations are mediated on the new type of Lithuanian farms, the following section examines one of the enterprises that introduced the vending machines to Lithuanian supermarkets. One of the companies that introduced vending machines in Lithuanian supermarkets belonged to Jonas, a farmer-entrepreneur from a medium-sized dairy farm who took over his parents' farm in the early 2000s and transformed it into a local marvel with eighty pure-bred cows and newly built facilities wired with process-control software. While Jonas's family applied for EU funding and received a compensation that eased his parents' transition to retirement, his case is unusual in that he funded his renovation projects through bank loans, not with the support of the EU farm restructuring programs or with loans from the dairy processors. Jonas sought bank loans primarily because they imposed considerably fewer restrictions on how he managed his farm. When obtaining loans directly from one of the three main dairy processors in Lithuania, farmers commit to selling milk to the processor at a cheap price. Jonas argues that this is a shrewd move on the part of the processors in that they ensured a secure and continuous supply of cheap milk for the largest processors. This strategy leaves medium-sized farmers fully dependent on their lenders and unable to increase the profit margins that they were expecting to achieve after modernizing their farms. Jonas says that since finishing construction and installation of the systems, his work as a farmer has dramatically shifted from looking after cows to analyzing graphs and numbers representing changes in dairy production, animal health, fodder supplies, milk quality, and workers' performance. Jonas is ambivalent about such a transformation. On the one hand, he welcomes the opportunity to use his training in agriculture and to continue the family tradition by raising it to a new level. On the other hand, the mechanization of dairy farming places new burdens on him. He is now forced to become an expert in dealing with loans and banks, environmental regulations, land use laws, septic systems design, underground water pollution limits, employment, and labor safety laws. He must also deal with the issues that the introduction of computers into the micromanagement of milk production have made visible. As Jonas moved upward in the scales of production, the industrialization of dairy production on his farm brought challenges and uncertainties that he had not experienced as a small-scale farmer. A brief example of how ethics becomes intertwined with life on Jonas's farm is instructive here. When presented with an opportunity to hire highly regarded foreign experts to help him build new farm facilities, Jonas did not hesitate. He knew the new barn would be expensive, but it was also clear to him that investments in optimal milk production environment would yield high profits in the long run. With new facilities he could compete with European farmers and supply cheaper milk to the local market. The key question discussed in the first meeting with representatives from the agricultural consulting firm was whether cow productivity in Lithuania was impacted more negatively by cold or by heat. "How often does it get below -20°C (-4°F) and how often does it get above +20°C (68°F) in any given year?" Jonas recalls being asked. He was quite surprised to realize that even though Lithuania was considered a Northern country, his cows were affected more by heat than by cold. After a more careful examination of local climatic conditions, the blueprints of the barn included large ventilation openings that provided little cover from cold. Despite having doubts about how this would affect his cows, Jonas built the barn according to the design, erecting an impressive structure in a landscape populated by small hamlets and worked by hands and old technologies. And his faith was rewarded. The animals did very well in summers; and even in the coldest winter periods, farm records based on the continuous flow of information from the barn captured only a minute dip in the productivity of the cows. This was no small feat in a dairy economy that is criticized for seasonal swings in milk production in the National Rural Development Plans (Ministry of Agriculture 2003). Yet, despite the obvious financial advantages of the new barn, Jonas received criticism from villagers who were ambivalent about the new ways of keeping animals. When cold fronts engulfed the region drawing in Arctic weather in winter months, villagers found themselves wondering about the well-being of the animals whose nostrils were covered with icicles for weeks on end. In the local cultural context where just a few decades ago farm animals were brought into people's living quarters to keep them warm, the practice of allowing animals to remain exposed to the cold raised significant moral concerns. While the new construction was justified scientifically, the disapproval in the village reveals the uneasiness with which the logics of efficiency, profit making, technological advancement, and economic success were being superimposed on the existing codes of behavior. In this new economic rationality, animal bodies were stretched to the limits of productivity, and costs were cut by building the most optimal facilities. In Lithuania as elsewhere, the values that undergird the development of the new methods of farming have drawn their legitimacy from hegemonic narratives embracing technological progress as an inevitable part of modernization. Still, the narratives of progress are not without interruptions and contradictions. As noted by scholars writing on alternative food economies in North American and Western European contexts, the idea of industrially produced food conjures images of insensitivity and exploitation and is inextricably linked with general riskiness, but also adulteration, contamination, environmental degradation, and social costs (e.g., Guthman 2004; Wales and Mythen 2002). It is because Jonas was aware of these popular concerns that he was careful with how he marketed his milk to the consumers by presenting it as a pure and authentic product. Paradoxically, while the raw milk sold through vending machines was marketed as "natural" and "closest to the animals," the locals criticized Jonas's farm for breaching these very values by interrupting nature's cycles and challenging local codes of behavior toward animals. As the logic of profit making trampled other considerations and established new kinds of relationships among animals, people, and technology, these new developments were greeted with distrust and moral condemnation in the village as well as with health and safety concerns among the urban consumers, even as the market economy had been embraced for more than a decade and industrialization went unquestioned. It should be noted, of course, that the moral claims that villagers made in their critiques of Jonas's building should not be seen as categorically different from the economic rationalities upon which the new farm was built. If anything, an argument can be made that the motivations for protecting domestic animals, too, were rooted in an economic logic in which the well-being of an animal translated into food and often cash. In famine-plagued times of war and collectivization, animals had been respected and loved, as sources of livelihood and means of survival, not as beings in and of themselves. From the perspective of contemporary animal rights movements, whose emphasis on the value of the nonhuman beings leading "quality" lives irrespective of human interests can be traced to Romanticism and the early days of industrialization, the protection from nature's elements and respect that Lithuania's peasants exercised in their interactions with domesticated animals may sound too instrumentalist and even exploitative. Yet what matters most here is not what ethical claims can be made in each case, but whose claims become naturalized and accepted as normative. In the context of the dominant market economy and European food politics, the ethics of productivity, efficiency, and profit making takes the upper hand. Indeed, while the villages considered Jonas's approach to animals as interrupting their moral framework, they did little to challenge him, offering only disapproving headshakes and voicing their criticisms behind his back. The fact that Jonas's breach of the existing morality went unchallenged suggests that there was an underlying consensus about markets and the new economy that many of the locals accepted as inevitable. As numerous scholars have shown (e.g., Féhérvary 2009; Verdery 1996), an almost universal embrace of capitalism in the region in late 1980s and the early 1990s relied on a widely held understanding that socialism was an immoral endeavor and that capitalism provided the only possible path into the future. In her article on consumer culture under socialism and the experiences of socialist consumer goods as inferior to those produced in the West, Krisztina Féhérvary (2009) shows how such experiences of poor quality translated into political critiques of socialism and the definition of socialism as an "inhumane" and morally failed system: Emblematic goods of state-socialist production as well as their settings came to be seen as evidence of the failure of a state-socialist-generated modernity, but more importantly, of the regime's negligent and even "inhumane" treatment of its subjects. In contrast, select commodities imported from the West (including socialist goods produced solely for export) were encountered as prized valuables and icons of a different world (Féhérvary 2009: 429). While official discourses in late socialism celebrated the socialist person as a moral hero who sacrificed him/herself for the well-being of others, the equally powerful counternarratives painted a different vision in which socialism was linked to neglect and violations of basic human rights and needs. As Féhérvary (2009) suggests, the moral failings of the socialist state were embodied in and reproduced through the socialist material culture that was defined by perennial shortages, the lack of aesthetic pleasures, informal transactions, and the scarcity of goods. Considering the embrace of the morally superiority of the "West," it is not surprising that the villages did not voice objections against the economic logic that led to placing Jonas's cows in the cold barn and that trampled their own understandings of morally acceptable behavior. In this sense, the social dynamics between the different moral orders of the village and the new generation of farmers were shaped not only by the recent developments in the postsocialist agrarian sector, but also during the years of late socialism when the socialist states lost their moral grounding. What makes milk produced on Jonas's farm ethical, even if it is seen by locals as violating their morals? What are the larger structural forces that create the conditions under which Jonas's farming practices become morally justifiable, even desirable? To answer these questions, I will show that the push toward productivity and the intensification of agricultural production that the villagers find so deplorable are linked to European ideals of well-being, social order, and historical justice. Additionally, the particular methods of food and agricultural production governance in Europe are themselves situated in larger global settings and the politics of neoliberalization. In the 1950s and 1960s, as European powerhouses like France and Germany were emerging from the devastation of World War II, their governments defined food security as one of the primary moral commitments and developmental goals on the path to a politically stable and economically prosperous Europe. In addition to feeding hungry cities, governments also sought to provide strong support for agricultural production in Europe to keep rural populations from flocking to the cities and joining the throngs of unemployed workers. Against the backdrop of Cold War politics, the principle of "more cheap food" also operated as a forceful ideological statement against the famine-stricken Soviet Union and against socialism more broadly. Driven by the mix of pragmatic and ideological considerations, the newly founded European Economic Commission introduced several market management and administrative measures that supervised and leveraged their resources to encourage agricultural production, especially in the dairy sector. In 1964, the Commission signed the first agreement (13/64/EEC) that coordinated milk collection prices in Italy, Belgium, the Netherlands, Germany, Luxembourg, and France. In this agreement, the Commission made a commitment to keep dairy prices stable across Europe's shared markets. Additionally, it increased tariffs on imports and introduced financial support for producers, setting the parameters for the heavily protectionist agrifood sector. The key mechanisms used in the implementation of price stability policies were intervention buyouts. When market prices dropped to the lower threshold, a policy mechanism was triggered to begin buyouts of significant amounts of dairy in the market, effectively keeping the prices from dropping precipitously. And when dairy product prices were climbing due to fluctuations in production or global markets, the state brought back the reserves and dumped them on the markets to keep the prices from climbing. While ensuring stable prices that benefited both producers and consumers, such policies also brought unanticipated consequences, namely the overproduction of milk as materialized in the mountains of dairy powder, stockpiles of butter, and rivers of milk poured on roads and fields during the farmers' protests. By the 1970s, memories of postwar food rations and scarcity had dissipated, and it was plenitude, not scarcity, that became Europe's political hot potato. To run intervention buyouts required enormous financial resources. Additional costs were incurred by transportation and storage of the butter and milk powder. Despite numerous attempts to limit intervention through butter purchases in the 1970s and early 1980s, the costs of these policies continued to hover at more than 30 percent of the entire European budget. In 1984-85, the Commission introduced a strict quota system that punished member states with heavy levies for exceeding their national quotas. This reform successfully curbed the production of dairy in Europe without totally dismantling the intervention system. But it was only a bandage on the mounting problems of surpluses and overproduction, which were increasingly defined as economically unsustainable, politically threatening, socially unjust, and environmentally problematic. By the time postsocialist countries joined the EU in 2004 and 2007, the GATT Uruguay Round agreements had been signed, pushing Europe further into the embrace of markets. In an attempt to keep political stability and maintain commitments to its farmers, the EU introduced the Single Farm Payment system. The system decoupled production from financial support for farmers by distributing funds to the farmers based on their historical performances rather than on current production levels. As a result of these transformations, the EU, and its dairy sector in particular, have evolved into a complex regulatory system where participating farmers must comply with numerous food safety, hygiene, animal well-being, and environmental protection requirements in order to gain access to funding. Each of these requirements was defined as the outcome of a value-neutral, technocratic decision. In practice, however, they reflected values that were embedded in particular experiences of historical development-those of prosperous Europe. These experiences were far removed from the shortages and subsistence ethics in the postsocialist region. By placing Jonas's farm into the longer historical trajectory of European efforts to provide food and foster economic prosperity, it becomes clear that his farm embodies the values and moral commitments that the European state is following in its policies. In this respect, the introduction of the new milk production and technologies on Jonas's farm is a model case for ensuring safety at the higher levels of production and in the context of the economies of scale that Europe supports. And his entrepreneurial skills and ability to reap higher profits by selling raw milk to the upper class and elite consumers create new niches for economic prosperity that are seen as crucial sites for building sustainable rural livelihoods. While the EU is still struggling to balance its protectionism and intense regulatory governance with the liberalization of markets and neoliberalization of its politics, Jonas has been able to reconcile the two forces and make a profit while doing so. What emerges from the case study of Jonas's farm, and the short overview provided above of the broader historical contexts in which the ethics of European agrifood policy evolved, is that there are several ethical orders operating at different scales. Across social sciences there is a growing interest in the diversity of modes of valuation, production, consumption, and distribution, including the work by J. K. Gibson-Graham (2006) on postcapitalism, Anna Tsing's (2009a, 2009b) analyses of supply chains and ecological standardization, as well as scholarship in biocultural diversity such as writings by Luisa Maffi and Ellen Woodley (2010) and Dan Brockington et al. (2008). Luc Boltanski and Laurent Thévenot (2006) have focused specifically on the diversity of ethical positions and the ways in which they are justified. In their examination of how people understand and articulate the values that undergird their actions, Boltanski and Thévenot (2006) identify six modalities that people use to link values and moral systems, on the one hand, with choices and everyday practices, on the other. To denote these different modalities, they have associated each ethical domain with names of individual thinkers: civic (Rousseau), market (Adam Smith), industrial (Saint-Simon), domestic (Bossuet), inspiration (Augustine), and fame (Hobbes). In addition to identifying and classifying several ethical orders, Boltanski and Thévenot also link them with particular practices and material infrastructures that are coproduced as people follow their values and implement them in real life. From the perspective of this approach, the organization of the two different ethical projects in Lithuania is a perfect example of the coexistence of diverse economies of worth. The focus on the values of safety and technology in the milk vending economy seems to match the market and industrial modes of organizing social and economic relations that are driven by the ideals of economic growth and technological progress. Similarly, the ethical claims made by participants in informal markets resonate with the values of the domestic life that are organized around trust, familiarity, and long-term relations. However, the approach to diverse economies of worth developed by Boltanski and Thévenot fails to address how these economies relate to each other, including in contexts of unequal power relations. By contrast, the case of raw milk economies in Lithuania suggests that the introduction of the vending machine economy works as an explicit critique of the semisubsistence agriculture and informal dairy markets, marking them as dirty and disorderly in advertising and the media. In other words, different economic niches do not operate in isolation from each other. Instead, they intersect, compete, and define each other. Additionally, the economies of worth approach assumes the relative stability of economic relations and value systems. If we consider food production under socialism, in the postsocialist 1990s, and under the European regime, we notice that the state institutions, technological infrastructures, and underlying value systems were significantly different in these different periods. Similarly, the ideas and values surrounding the notion of entrepreneurship have shifted significantly from its condemnation as unethical under socialism to its proclamation as an expression of freedom in the 1990s. In other words, the economies of worth approach has so far overlooked how ethical orders are changed, interrupted, unmade, and reorganized, in favor of emphasizing the processes of routinization, normalization, and institutionalization. By contrast, in my analysis here I have grappled with the pressing questions of how certain economies of worth are abandoned, how new modes of valuing people, animals, land, and technologies are introduced, and how these modes of justification compete and are negotiated in particular contexts. More specifically, in the name of protecting public health and managing food risks, the EU has not only supported the consolidation of agriculture and industrialization, but has also introduced a wide range of economic and administrative measures designed to eliminate informal raw milk economies. Armed with the set of new regulations and backed by the EU institutions, Lithuania's Food and Veterinary Service is now pushing for policing of the streets and the eradication of informal food economies. In these efforts, poverty-driven food economies are constructed as "dangerous" and "corrupt," while the proliferation of the vending industry accompanied by its claims to "quality" and "risk-free" food embodies the formation of a particular set of moral commitments. In this context, the language of uncleanliness and riskiness of the informal economy and the claims to safety of the vending industry in public discourses provide powerful justification for the market economy and its auxiliary moral code. Throughout this discussion I sought to track the ways in which consumers and producers in Lithuania have carved out different economic niches that relied on and were reproduced through particular sets of values and moral commitments. The consumers participating in informal markets shopped for what could be considered unsafe food in their attempts to mitigate economic risks and serve their families inexpensive and nutritionally rich food. At the same time, the elites bought quality, artisanal food, such as raw milk delivered directly from the farm to the vending machine, as a means of ensuring the safety and healthiness of their foods and cleanliness of their environments. This gulf in consumption patterns was also paralleled by the division in the food production domain where semisubsistence economies were marked as backwards and dangerous, while the new generation of farmer-entrepreneurs was lauded as models of success and economic prowess by the popular media, national government, and European institutions. Yet in the local contexts, where farmers built modern facilities, replaced older mixed breeds with more productive specimens, and introduced technology-centered farming practices, these advancements were often considered to be ruthless and morally suspect by the villagers who, nevertheless, accepted them as inevitable. In the case of raw milk vending, the new barn design challenged locally existing social norms and conventions, even if the locals rarely voiced their concerns. In examining how different ethical considerations intersected in the raw milk vending economy, I suggest that there were several moral orders operating at the same time, and that these orders were organized and reinforced hierarchically. On the one hand, there were ethical concerns of the villagers who were critical of the new methods of farming and models of economic behavior. On the other hand, there was a worldview of the new farmer who mobilized economic, social, and natural resources in order to live the life prescribed by the capitalist market order. Although the new farming practices appeared morally problematic for the villagers, they accepted them as inevitable developments in the global economy governed by technical and financial rationalities. It is from the perspective of the supranational European state that these technical and bureaucratic mechanisms carried out the European mission of providing affordable and safe food for its citizens. Embodying the post-World War II commitment to prosperity and public health, technocratic methods designed to tackle illegal economies and clean Lithuania's streets from unauthorized vendors operate as disciplining tools superimposing their moral order on the lifeworld in Europe's eastern frontiers. In a broad sense, this chapter is as much about morality and ethics as it is about power. Considering this insight, I would like to suggest that the notion of "ethical food" itself needs to be expanded and revised to include a wide range of practices, actors, narratives, and identities. We tend to think about "ethical food" in terms defined by Western experiences (cf. Freidberg 2004; Guthman 2004; Goodman et al. 2011), including labor conditions, human rights, environmental protection narratives, animal well-being issues, aesthetic appreciation, and Slow Food ideals, among others. 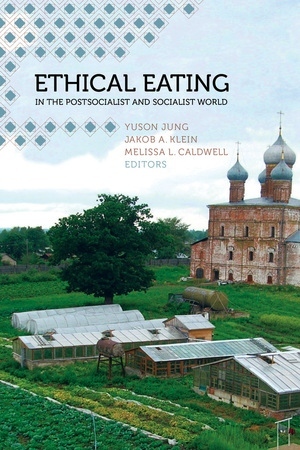 From the perspective of postsocialist Lithuania, ideas about what constitutes "ethical food" have not taken into account poverty-driven economies and gray economic zones, even though the language surrounding the people and commodities involved in them is often cast in moral terms. The next step in reconsidering a postsocialist food ethics, therefore, is to move beyond the universalizing language of ethics in order to situate it within specific historical contexts and geopolitical structures. Current discussions of the ethics around alternative food movements--concepts such as "local," "organic," and "fair trade"--tend to focus on their growth and significance in advanced capitalist societies. In this groundbreaking contribution to critical food studies, editors Yuson Jung, Jakob A. Klein, and Melissa L. Caldwell explore what constitutes "ethical food" and "ethical eating" in socialist and formerly socialist societies. With essays by anthropologists, sociologists, and geographers, this politically nuanced volume offers insight into the origins of alternative food movements and their place in today's global economy. Collectively, the essays cover discourses on food and morality; the material and social practices surrounding production, trade, and consumption; and the political and economic power of social movements in Bulgaria, China, Cuba, Lithuania, Russia, and Vietnam. Scholars and students will gain important historical and anthropological perspective on how the dynamics of state-market-citizen relations continue to shape the ethical and moral frameworks guiding food practices around the world. Yuson Jung is Assistant Professor in Anthropology at Wayne State University. Jakob A. Klein is Lecturer in Social Anthropology at the School of Oriental and African Studies (SOAS), University of London. Melissa L. Caldwell is Professor of Anthropology at the University of California, Santa Cruz and the author of Dacha Idylls: Living Organically in Russia’s Countryside and Not by Bread Alone: Social Support in the New Russia. "Through its focus on memories of state socialism and everyday ethics and practices of contemporary food movements, this collection provides a provocative vantage point for assessing similar movements in "advanced capitalist" countries. Rich and nuanced, and written by leading scholars, it poses the relationship between states, markets and local practices in rich, contextual fashion. "—David Sutton, PhD, author of Remembrance of Repasts: An Anthropology of Food and Memory and co-editor of The Restaurants Book: Ethnographies oif Where We Eat.